Dating an era is a tricky and subjective process. Few would question the proposition that Wales enjoyed a Golden Age in the 1970s, but when it ended is another matter. You could say 1979. That is neat in terms of decades and takes in Wales's third championship in four seasons, all of which also saw a Triple Crown. There's a case for the defeat at Twickenham in 1980, the first loss to another home nation since 1975 accompanied and abetted by the sending-off of Paul Ringer, the inhibiting after-effects of which took years to shake off. But perhaps the strongest argument is for March 18 1978, the date which saw the last Five Nations championship appearance by Phil Bennett, Terry Cobner and Gareth Edwards. There would have been a fourth, but Gerald Davies missed his last championship outing after a pulling a hamstring playing for Cardiff against Orrell. Cobner and Gerald Davies were to go on that summer's tour of Australia, each in turn becoming captain, but such trips were then subordinated in importance to the Five Nations. And there is also little doubt that, magnificent players though the others were, the giant among them was Gareth Edwards. 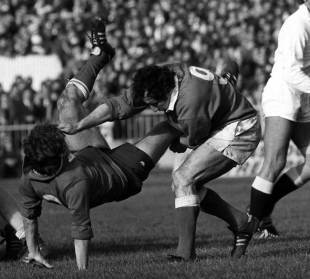 The match on March 18 1978 was era-ending in another sense, the last in a sequence of three seasons in which every Wales v France match was a Grand Slam showdown. Neither lost to anyone else during that time, and while they would finish first and second again in 1979, Wales took the title because France had lost at Twickenham. Wales arrived at the National Stadium clutching the third of that quartet of Triple Crowns, but seriously banged up after a 20-16 win in a furious contest at Lansdowne Road which saw Moss Keane rousing the Irish pack to extraordinary efforts and JPR Williams ruthlessly late-tackling Mike Gibson. The training session on the weekend in between was so poor that coach John Dawes cut it off early. France arrived with eight consecutive championship wins under their belt and the vast, plug-ugly pack which had ground them to a Grand Slam in 1977 almost wholly intact. Tiny Napoleonic scrum-half Jacques Fouroux had retired, handing the leadership on to his physical opposite, the giant number eight Jean-Pierre Bastiat, and the number nine shirt to a dynamic newcomer Jerome Gallion, who had scored in each of this first three championship matches. Edwards, who had become the first man to play 50 times for Wales in a tight, rain-sodden 9-6 victory at Twickenham, had decided that the French match would be his last. "Only I knew that I was going to Cardiff Arms Park for the last time in a Welsh jersey and I so much wanted to leave good memories of my play," he recalled in his autobiography. "I wanted to say a big thank you: I wanted to win. I wanted to show the world that I was too good to be upset by the bright new star, Jerome Gallion." "Numbers only tell a fracture of the story, but give some flavour of his standing in the game in 1978. With a total of 63 caps, 53 for Wales and 10 for the Lions, he was joint third behind Mike Gibson and Willie-John McBride in the all-time list, the most capped Welshman and most capped scrum-half of all time." France, who as Edwards recalled had inflicted the only home defeat of his championship career, back in 1968, began like winners. Jean-Claude Skrela, who with Bastiat and Jean-Pierre Rives formed a world-beating back row, scored a try and outside-half Bernard Vivies landed a drop for a 7-0 lead. Wales did not panic. As a team they were accustomed to starting slowly before imposing themselves. The ever-analytical Daily Telegraph writer John Reason attributed the revival to Aberavon lock Allan Martin, reckoning him to have played a part in each of the three scores which followed in rapid succession in the final minutes before half-time. First came his part in an adept wheel of a French scrum 10 metres from their line which enabled Wales to steal possession and Martin to feed Bennett, who moved sharply down the blind-side and sidestepped two defenders for a score which he converted himself. Then, on Reason's interpretation, Martin's dominance in the line-out forced France to throw long and wildly. Graham Price gathered himself for a charge, then checked and fed Edwards, who landed the drop-goal which gave Wales a 9-7 lead. Last in the sequence was the masterpiece. Martin stole another French throw and centre Ray Gravell launched an assault on the opposing line which was continued by Steve Fenwick and Edwards. Edwards' pass out of contact was misdirected, but scooped off the ground and redirected by JJ Williams, passing one-handed from somewhere near his right ear, in the direction of Bennett, who crossed for his second try in a few minutes. By this time one French commentator was proclaiming that "this is surely the greatest rugby there has ever been". Edwards did not remember it like that, recalling that "we snatched the Grand Slam from France", but the effect of this explosion of scoring was to turn France's 7-0 lead into a 13-7 interval deficit. France were not finished. They pressed furiously for long periods and, in Bennett's recall, were repulsed as much by the National Stadium crowd as Wales's defence. "The noise of the crowd's singing seemed to intensify and somehow we held on. I never normally noticed the crowd when I played for Wales. I blotted them out and kept my mind on the game. But that day they refused to be blotted out," he later remembered. "It was as if their noise, their desire came on to the field as an extra force. They became part of our weaponry, part of us as a team. I had never known anything like it. It was a victory based on guts, spirit and formidable support. Playing ability was way down the list." A Bennett drop-goal completed the scoring for Wales's 16-7 win, and it was only after the game that each of the Welsh half-backs, who between them had accounted for all of the points, learnt that the other was also planning to retire. It was Wales's last Grand Slam for 27 years. Dawes proclaimed at the post-match press conference that "this team deserves to be recognised as the greatest of all time". It was honoured by a Downing Street reception hosted by Prime Minister James Callaghan, a Cardiff MP. Bennett's final act as Welsh captain was to sign off on behalf of the WRU a breath-taking bar bill run up in the Angel Hotel by the wine connoisseurs of the French team. Bastiat, Skrela and formidable lock Michel Palmie, who was banned for life for violent play but has been rehabilitated to the extent of becoming a big wheel in French rugby administration, also played their last matches. But it was Edwards who dominated the reaction. Numbers only tell a fracture of the story, but give some flavour of his standing in the game in 1978. 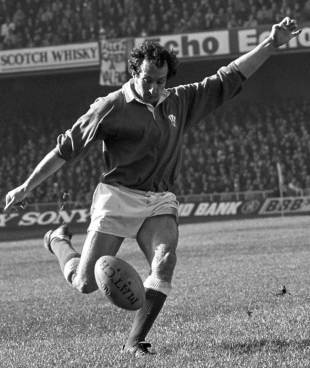 With a total of 63 caps, 53 for Wales and 10 for the Lions, he was joint third behind Mike Gibson and Willie-John McBride in the all-time list, the most capped Welshman and most capped scrum-half of all time. His 20 tries put him fourth on the all-time scoring list amid a welter of wings and he was joint second in championship history with 18. Only Colin Meads with 41 exceeded his 40 wins in tests, while his 32 championship wins were a record. Quite how different the game now is can be gauged by a comparison with Sam Warburton, who is scheduled to equal Edwards' 53 Welsh caps when Wales play Ireland next month. Of those 53, only 24 will have been in the Six Nations, compared to Edwards' 45 Five Nations games for Wales. Warburton will reach the mark in around five years and nine months, compared to Edwards' 11 years. And where Edwards knew and had played with or against the handful of men who had played as much international rugby as him, Warburton will stand joint 396th on the all-time caps list when he leads Wales out to play Ireland. Nor any longer do you get miner's sons playing for Wales. One thing has not changed. Whenever rugby fans with any sense of history embark on what Americans term the GOAT (Greatest of All Time) debate, Gareth Edwards' name is one of the first to be mentioned. Nor is that likely to change any time soon.